Shingles (herpes zoster) is a viral disease caused by the same virus that is responsible for chicken pox. It usually strikes people in their 60s who had chicken pox as children. The virus causes pain in the area of the inflamed nerves, followed by a red rash with small fluid-filled blisters. The pain caused by inflammation of the nerves can continue long after the rash has cleared. The antiviral drug acyclovir can speed the healing of the rash and reduce inflammation of the nerve endings if treatment is started early. 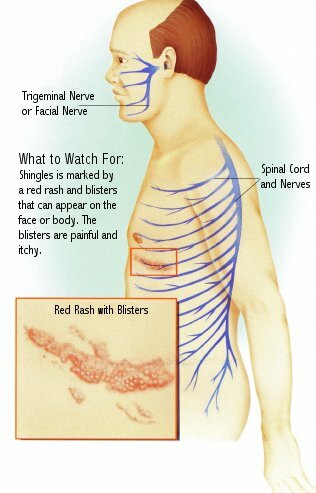 The blisters that appear along with a red rash in shingles can be painful and itchy. Shingles is a painful inflammation caused by the same virus that is responsible for chicken pox. The virus, known as varicella-zoster, can remain inactive in the nervous system of chicken pox victims for decades and then, for unknown reasons, it can become active. Persons who develop shingles often cannot recall being exposed to a person with chicken pox when the symptoms of shingles appear. Shingles rarely appears more than once during a lifetime. Factors: Shingles usually occurs in persons past age 60 who had chicken pox as children. The virus infects the nervous system and afterward stays inactive for years. The virus, after reactivation, causes pain in the area of the inflamed nerves, usually in the face and areas of the body adjacent to the spinal cord and its nervous system. The seriousness of shingles depends on the age of the patient and the state of the immune system. In children, cases of shingles are usually mild and the rash develops without pain. In patients over age 50, up to one half will have severe pain that lasts for more than one month. Patients with a poorly functioning immune system, such as those with AIDS or lymphoma, may have a more severe case, take a longer time to heal and they may develop more serious complications from the infection. Symptoms: Typically, the beginning of shingles is marked by pain, tingling or itching in a single area about 48-72 hours before a rash develops. The red rash is quickly followed by the formation of vesicles, or small sacs filled with fluid, that look like chicken pox vesicles but are confined to a smaller area. The vesicles form for 3-5 days, then usually dry up and the scabs fall off within two weeks. In some cases, though, the skin may not return to its normal appearance for a month. Usually the rash appears on one side of the body, on the arms or legs or on the trunk. Unusual patterns of infection include shingles on the eyelids or across the nose, a sign that an eye infection could develop or has already developed. In these cases, an ophthalmologist should be consulted immediately to start early treatment because severe eye pain may occur and there is danger of glaucoma or blindness. Vesicles can also appear in the mouth, on the tongue or in the ear canal. These infections can leave a patient with facial weakness, loss of taste, hearing loss, dizziness and changes in sensation in the affected area. Weakness may develop in the extremities up to two weeks after the rash appears. Unfortunately, for one fourth to one half of patients, pain may remain after the rash is gone, a condition called post-herpetic neuralgia. Constant and severe pain or on-and-off stabbing pain are symptoms. Changes in temperature may also worsen pain. Treatment: The goal of treatment is to stop the spread of the virus within the nervous system. Acyclovir is an antiviral drug that heals and prevents nerve inflammation if given early in the disease. In most patients it is given orally 5 times a day for 7-10 days. Soaking the affected area with aluminum acetate solution (Burow’s solution) for the first day or two soothes and cleanses the rash. Analgesics such as acetaminophen or ibuprofen can reduce the pain during a shingles outbreak or from post-herpetic neuralgia. For chronic neuralgia, drugs such as amitriptyline and fluphenazine have been shown to provide relief. Shingles is a painful condition that affects older adults who have previously suffered from chickenpox at some point in their lives. It is caused by a reactivation of the varicella zoster virus that lies dormant (not active) in the body’s nerve cells. For reasons that scientists do not fully understand, varicella zoster can become reactivated many years after an infection with chickenpox and travel along the nerve paths to the skin’s surface. The virus causes a painful rash that eventually turns into tiny blisters, which break open and crust over. Antiviral drugs can be used to reduce the severity of symptoms and shorten the attack, but they are effective only if they are used within 72 hours of the appearance of the rash. For most shingles sufferers, the entire shingles outbreak lasts four or five weeks. But for almost one third of patients age 60 years or older who develop shingles, the pain lingers for months, even years. This chronic painful condition is known as postherpetic neuralgia. Postherpetic neuralgia is difficult to treat, and the long-standing pain can cause patients to become depressed and unable to care for themselves. There is hope, however, for the millions of older people who have not yet suffered from shingles. A shingles vaccine has been developed and is awaiting approval by the FDA. In clinical studies, this vaccine prevented shingles in about half of the patients who received it, and those who did contract the disease had a milder case than they would have had otherwise. Shingles is a problem for over one million people each year, half of whom are over age 60. Incidence increases with age: Of all people who live to age 85, half will develop this condition. The greatest risk factor is a previous bout with chickenpox, since a person must have a history of chickenpox to develop shingles. Older people have the greatest risk, which may be related to a weaker immune system that comes with aging. Shingles will develop in one of every five persons over age 50 who had chickenpox before. It is also more likely to occur in people with weakened immune systems due to other causes, such as cancer, organ transplant, HIV/AIDS, or use of drugs that suppress the immune system, including steroids or chemotherapy. Regularity of Symptoms: Symptoms follow a fairly regular pattern, beginning with a tingling, numbness, or burning sensation under the skin. Shingles often causes generalized feelings of illness, like fever and chills, nausea, or a headache. After a few days, a rash appears in the pattern of a band, often on one side of the body, face, or neck. The rash begins as small, itchy bumps, which eventually fill with fluid, break open, and crust over into scabs. The area usually heals without scarring unless it becomes infected. Early Diagnosis: Rapid diagnosis of shingles is very important, since antiviral medications do not work if given more than 72 hours after the rash appears. Although diagnosis is usually made by inspecting the rash and its pattern, laboratory testing can confirm the diagnosis. Once shingles is diagnosed, it is important for the patient to avoid people who have never had chickenpox, since exposure to shingles can cause chickenpox in these people. However, exposure to shingles will not cause someone else to “catch” shingles, because shingles only comes from a reactivation of virus that has become dormant after a bout with chickenpox. To Relieve Symptoms: If treatment is begun within 72 hours of the appearance of a shingles rash, such antiviral medications as acyclovir, famciclovir, or valacyclovir can significantly reduce the severity of symptoms and shorten the attack. Antiviral medications given soon after the rash appears may also help prevent the development of postherpetlc neuralgia � a painful complication of shingles that is not easily treated. Other treatments for shingles can help relieve pain and itching. Cool soaks or oatmeal baths may be recommended to help speed the drying and healing of blisters. For pain control, analgesics (painkillers), steroids, antidepressants, and anticonvulsant medicines are options. Potential Complications: Most people who suffer from shingles completely recover in four or five weeks. However, complications can arise in some people that can be serious consequences of varicella zoster reactivation. The rash may become infected with constant scratching, and antibiotics may be required to treat it. If the shingles rash is located near the eyes or ears, damage to sight or loss of hearing can result. Another serious complication of shingles is postherpetic neuralgia, a sharp or throbbing pain under the skin that remains after the rash of shingles has healed. Postherpetic neuralgia can cause pain so severe that it hurts to have clothes touching the skin. 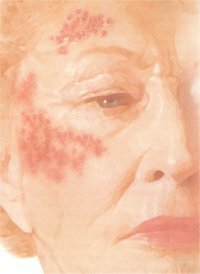 The older the patient is when shingles develops, the greater the chance for postherpetic neuralgia to develop. This nerve pain can last for months or even years, making routine activities difficult and resulting in serious depression. A New Preventive Measure: A vaccine similar to the chickenpox vaccine will soon be available for older patients at risk of developing shingles. Millions of people may never suffer the pain of shingles or may have only mild symptoms. 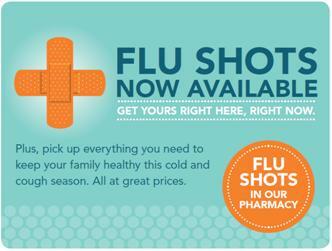 As our population ages, this vaccine will be a powerful weapon against shingles and its possible debilitative effects.